COMMENTS ON INDIAN COMPANY LAW: ALL COMPANY DIRECTORS HAVE TO FILE DIR-3 KYC on or before 31st August,2018 WITH MCA. 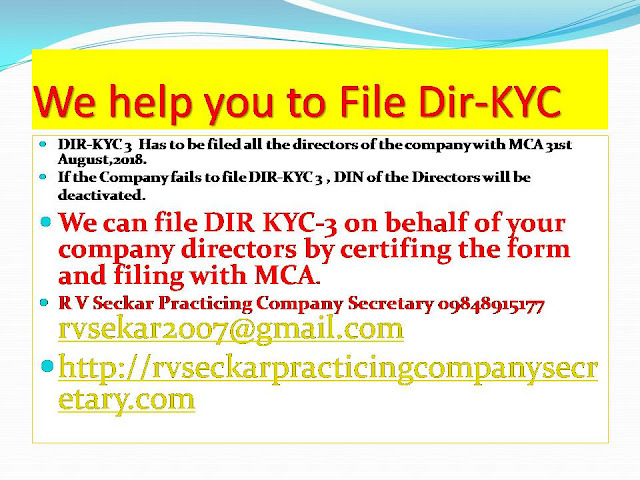 ALL COMPANY DIRECTORS HAVE TO FILE DIR-3 KYC on or before 31st August,2018 WITH MCA. Mobile Number and E-mail id is to be registered compulsorily. While filing the form,the Unique Personal Mobile Number and Personal Email ID would have to be mandatorily indicated and would be duly verified by One Time Password(OTP). Active and Disqualified Directors have to file DIR-3 KYC compulsorily. After expiry of the due date by which the KYC form is to be filed,the MCA21 system will mark all approved DINs (allotted on or before 31st March 2018) against which DIR-3 KYC form has not been filed as ‘Deactivated’ with reason as ‘Non-filing of DIR-3 KYC’. Act, 2013 including sections 164 and 169, and" which I felt that is contradicting to the point that the disqualified directors should file the KYC form.